As a kid there was no vacation I looked forward to more than one where we went camping. My childhood is filled with great memories of sleeping under the stars in a cozy sleeping bag, making S’mores over a campfire, and telling spooky stories with just the light of a flashlight. 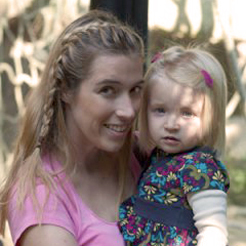 Now that I’m a parent, I get to see my daughter’s eyes light up with excitement any time I mention camping. And we don’t need to go to a National Park or far into the woods to get our adventure; we can do it right in our own backyard. Here’s my step-by-step guide for pulling off the perfect camping trip…without leaving home. These days tents come in all shapes and sizes. Look for one that’s tall enough for everyone in the family to stand up in and wide enough for your supplies (like clothing and sleeping bags). 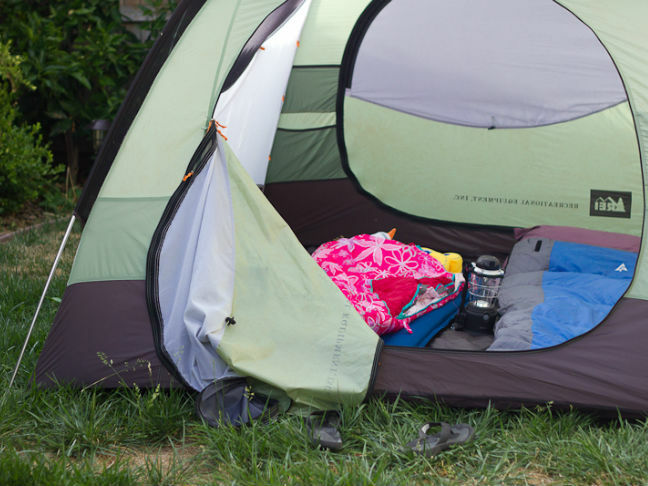 Bonus: Most tents are now so simple that it takes mere minutes to have them up and ready, which means that you can decide to camp in the yard at the last minute. Getting all warm and snuggly in a sleeping bag is one of the best parts of camping. My daughter calls hers a “snuggle bag” and the bright colors make it fun. >Here’s a tip: Each bag has a temperature rating that identifies how low the temperature can drop for you to still be comfortable in it. If you’re camping in the summer, a 35-degree bag (meaning you’ll be comfortable if the temperature drops as low as 35) is fine; if you’re camping in the spring or fall, look for temperature ratings between 10 and 30 degrees. Even if you’ve got a nice comfy lawn, you’ll want extra padding between you and the ground. We have self-inflating mats that fill quickly and roll up easily. If you don’t want to invest in anything extra you can also use that spare inflatable mattress you keep at your house for guests. No matter how close you’re sleeping to the house and exterior lighting, you’ll want to have a flashlight on hand. It’ll keep your kids feeling safe that they have a light if they need it, and it’s also handy in case of any middle of the night potty trips back to the house. 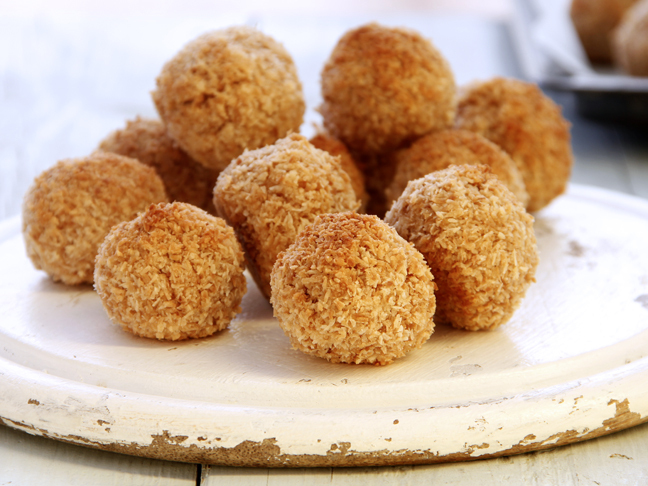 No campout is complete without some special camping treats! For us that means S’mores and campout ice cream. Make traditional S’mores (you know, graham cracker sandwiches filled with toasted marshmallows and melty chocolate squares) in an outdoor fire pit. 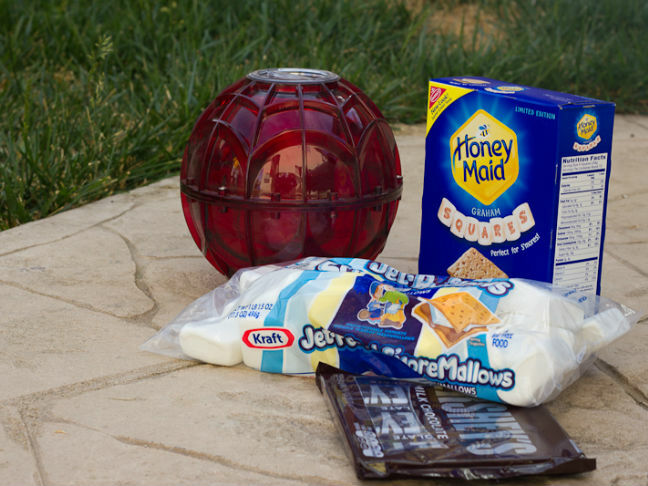 Or, if you’re like us, improvise and make ’em on your grill with a S’mores Grill Tray. You’ll get perfectly plumped up marshmallows and melted chocolate without much mess. 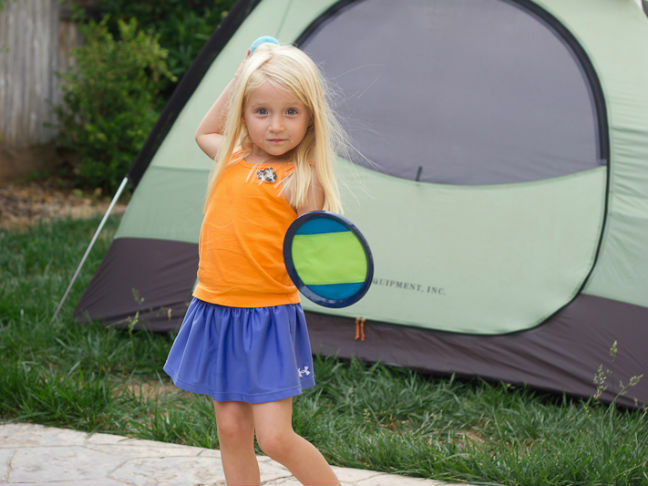 We take this gadget with us on camping trips, but it’s just as fun as an activity in the backyard. Just fill the metal canister with ice and rock salt, then add half and half, sugar, and vanilla to the other end and roll the ball around the lawn. Within minutes you’ll have fresh vanilla ice cream! 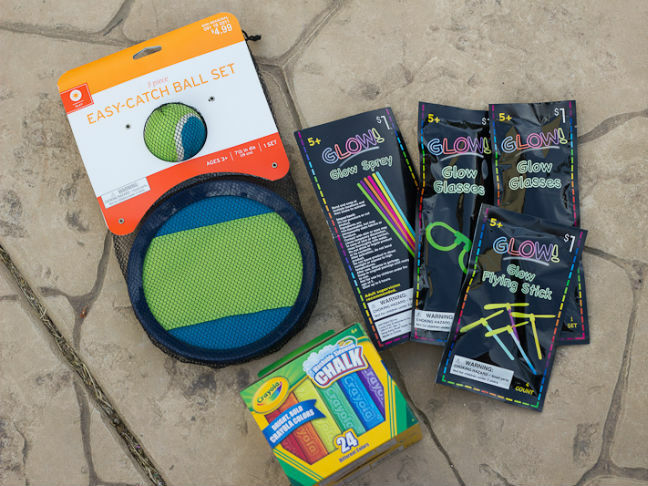 Gearing up for a camping trip as a kid always meant some fun new games and activities. So spend the entire evening outdoors having fun before it’s time to get some shut-eye. Playing catch in the summer is always a hit in our house. With little kids it’s sometimes much easier to throw than catch, so we like these easy catch mitts with velcro. 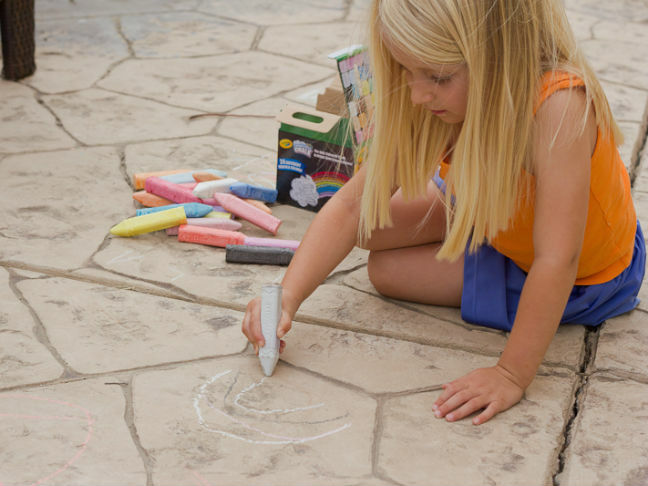 While we cook up the S’mores, we give our daughter some sidewalk chalk and let her decorate out patio. 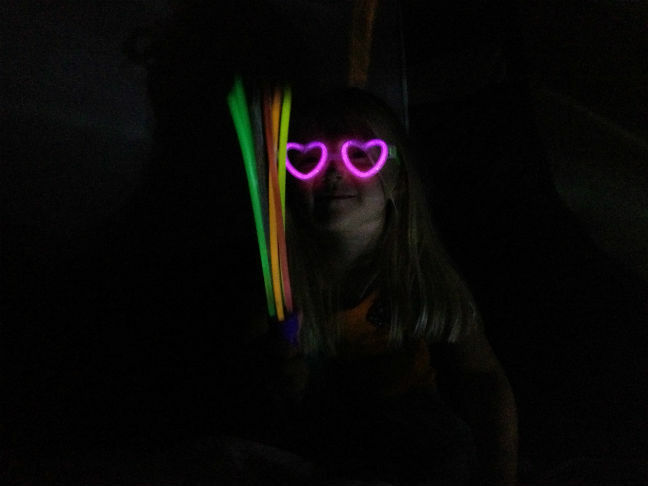 Camping outside in the dark is lots of fun, but we make our tent time extra special by purchasing a few glow accessories for our daughter to play with. They’re rarely more than $1 each and they’re fun to play with inside the tent, too.